Truck accidents can be devastating. Due to their size and weight, a truck is one of the worst types of vehicles that can be involved in a motor vehicle accident. Trucking accidents can have fatal and tragic results. As trucking injury attorneys, we know that big rigs, for example, usually weigh over 80,000 pounds. If an 18-wheeler that weighs 40 tons is speeding even just a little bit above the limit, it can be that much more difficult for it to brake and stop properly which, can result in the truck jackknifing or otherwise going out of control and colliding with other vehicles or even multiple vehicles. What are Some Common Types of Semi-Truck Crashes? Jackknifing A jackknife is when the back end of the trailer swings suddenly out of sync with the forward tractor and is usually caused by a sudden braking of the rig. Many times the driver can regain control but, when the don’t it leads to the entire rig going completely out of control. Underride Collisions This is when a motor vehicle actually goes up underneath the trailer of a truck. Depending upon the speed of the two vehicles, how quick the reaction time is for the big rig operator and other factors, this can result in a complete shearing off of the windshield and top portion of the vehicle underneath and significant personal injuries or death. Truck Rollovers Due to the height of a truck trailer and other factors including high winds, unsafe speeds and sudden braking, a truck can completely turn over on its side. This creates a serious chance of collisions both at the time of the roll over and from approaching traffic. Tire Blowouts Semi-trucks are called “18 wheelers” for a reason. There are a total of 18 wheels on most tractor-trailer rigs and any one of these can blow out at any time. Many times, this occurs without incident but, sometimes the tire shearing caused the truck to lose control or causes other motorists to swerve to avoid being hit by the rubber or other debris which, in turn, causes mishaps. What are Some of the Principal Causes of Big Rig Collisions? Fatigue caused by lack of sleep due to overdriving oftentimes in violation of regulation. According to recent California statistics, over 12,000 commercial and semi trucks were involved in non-fatal accidents in just one year. Additionally, over 5,000 truck accidents resulted in injuries. In the entire country – not just southern California – almost 5,000 of these types of accidents were fatal and because of California extensive interstate highways, most of these occur in and around freeways in the Golden State. This number is far too high, especially when most of these incidents could have been prevented if the truck driver wasn’t negligent or if someone didn’t make a careless decision. Our California truck accident lawyers are here to help you if you or someone close to you was hurt in a truck accident. Most truck drivers spend hours – even days – traveling through the entire country, not just through Los Angeles and southern California. Because of this, most drivers are very fatigued. Being tired delays your reactions and impairs your judgment and can almost be just as bad as driving while intoxicated. 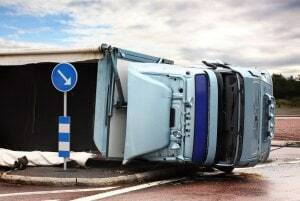 Why is it Important to Consult with and Retain a California Truck Accident Lawyer as Soon as Possible? If you feel that a truck driver’s negligence or the negligence of their employer has caused personal injury or wrongful death to you or your loved one, you may be entitled to compensation. It is important to promptly investigate these claims to determine cause, background of the driver, history of the employer’s driving practices (including violations), insurance information and other matters. Call 866-966-5240 toll free for an immediate and free, in depth consultation. We don’t charge anything until we recover money for you.